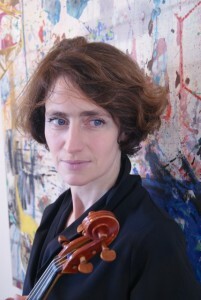 Geneviève Strosser studied with Claude Ducrocq in Strasbourg, Serge Collot and Jean Sulem in Paris, and had lessons with Yuri Bashmet, Franco Donatoni and György Kurtág. She gave solo performances with e.g. Gewandhausorchester Leipzig and the BBC National Orchestra of Wales. She can be regularly heard at the Festwochen in Salzburg and Berlin, Ars Musica and Wien Modern. Strosser has a strong affinity with contemporary music. She was a member of the Ensemble Intercontemporain, Klangforum Wien and Contrechamps. Composers such as Stefano Gervasoni and Hugues Dufourt dedicated solo concerti to her. In 2011 she released a CD with solo works by Holliger, Ligeti, Donatoni, Lachenmann and Scelsi. She furthermore teaches string quartets at the Trinity College of Music in London and viola at the Musikhochschule Basel. This week, Strosser comes to The Netherlands to world-premiere a viola concerto by Hanna Kulenty with the Residentie Orkest. DVS: Tell us about the Hanna Kulenty concerto, what is its origin, how do you experience it? How did you get involved, and what is your working relationship with the composer? The person I’m happy to thank for this project is Neil Wallace, head of De Doelen, Rotterdam. Thanks to him, I got to know Hanna Kulenty. He commissioned a piece for viola and ensemble which ASKO and I performed 3 times, 2 years ago. Neil Wallace was so enthusiastic about this 1st version – and so was I – that he asked Mrs Kulenty to do a version for viola and orchestra. I have to say that the Hanna Kulenty concerto has a very specific aspect, which does not exists in a lot of modern pieces, which is to come back to the real “playful” feeling, exactly like the little child, in the best way. It’s something so important for the interpreter. I communicate with Hanna Kulenty via mails, she’s very inspiring in her answers! DVS: You seem to be surrounded by a cloud of composers who like to write for you. Is there any particular contribution from your side in the creative process of these composers? I’m not exactly the type of instrumentalist who goes to composers and show them all kind of possibilities our instrument offers (but I’m thankful to the people who do!!). I think it’s a very personal aspect of each interpreter. The composers who wrote for me had either heard me playing, or coincidence made us meet! I’m very lucky to have a long working relationship with great composers like Heinz Holliger, Helmut Lachenmann, Georges Aperghis, George Benjamin, Stefano Gervasoni…. DVS: Does the viola have particular intrinsic strengths as a catalyst for innovation in music? If so, what would these advantages be, compared to for example the violin or cello? Probably the strength you mention is that in the past centuries, the repertoire of solo violin or cello has developed much more, so it’s very likely that the composers feel the viola being a “free land” where they can explore, like a “tabula rasa”. And great composers of the 20th century like Luciano Berio, Bernd Aloïs Zimmermann, opened the way for the next generations. DVS: You do seem to have a strong affinity towards contemporary music. Do you experience a fundamental difference between the “classical” viola repertoire (let’s say, anything written before roughly 1950) and the contemporary pieces – if nothing else, in terms of “work satisfaction” as a performing artist? Maybe one fundamental difference is that with modern repertoire, there is not the weight of tradition. Probably we should learn from each, build tradition in the 20th century, and free ourselves from the tradition in the past centuries…. It’s the same for the public who is without any reference in modern music. a) The viola and violin have more similarities than differences, and students should practice both instruments as much as possible, learning the best of both worlds. b) The viola and violin are related yet significantly different worlds, and a student hoping to master either one should focus on one instrument (at a time). DVS: Tell us about your own process of learning to master the viola, from your very first lessons until the last lesson. Who do you recall as most influential? I started with the violin when I was 8, and after a few years, I suppose it has as well something to do with early teenager, I was not anymore so much attracted to the instrument. I was playing the piano as well. I decided I should maybe change violin teacher, and someone advised me to see the viola teacher in my home-town (Strasbourg). This person, Claude Ducrocq, from the very first lesson, gave me the desire to play the viola and not to do anything else….. I often think that if he had been a bassoon teacher, maybe I’d now be a bassoonist! I entered the Conservatoire National Supérieur de Paris, in Serge Collot’s class, great teacher, then Jean Sulem. After the Conservatoire, I had a lot of advice from…. violinists as well! The process of learning never stops, to my point of view, and each concert is part of it. DVS: Through the internet, Viola students today have some opportunities that previous generations could only dream of. For example freely available recordings of great violists on YouTube, and vast stores of downloadable sheet music. Could this trigger changes in professional music education (e.g. repertoire training), and should teachers more aggressively explore the associated potential opportunities? Internet is fantastic, and all the documents we can find is truly unbelievable! Not only for the students. I think that there is still a lot to explore in the opportunities that existed before internet. I don’t today see something that revolutions the way of teaching, as a teacher. But sure, for the students, it’s very different. DVS: On the other hand, might there also be risks connected to the aforementioned opportunities? The risk of course, is to believe in everything on internet, and to stop thinking individually, to stop searching alone, in your room, with your instrument. DVS: Are there specific projects or events in the near future that you are looking particularly forward to? In the very near future, I’ll be playing Janacek string quartet, for the opening of the exhibition of Josef Sudek photographs, in the Musee du jeu de Paume in Paris. Josef Sudek loved music, often went to see Janacek, and organized himself a lot of concerts. Our performance will take place in the rooms with the photos, probably very moving for us and the public. Come to Strosser’s performances of the Kulenty Concerto in Rotterdam (13/5) and/or The Hague (14/5). Additionally, on Wednesday 11/5 she gives a solo recital and masterclass in The Hague, co-sponsored by the DVS and Codarts Rotterdam. This entry was posted in Artikelen, Interviews, Nieuws and tagged concerto, kulenty, masterclass, rotterdam, strosser, the hague by DVS. Bookmark the permalink.